Fighting Words helps students of all ages to develop their writing skills and to explore their love of writing. 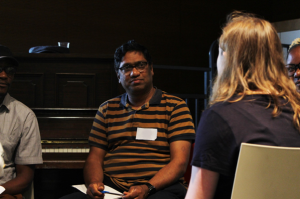 Throughout the month of July, Fighting Words facilitated workshops for adults from the DCU University of Sanctuary programme in the Gate Studio. Our creation is driven by the stories of the participants, who come from diverse cultural and ethnic backgrounds through the DCU University of Sanctuary programme. They are here to share their experiences and make work as part of a series of workshops in the Gate Theatre, Dublin with Fighting Words. It is Tuesday morning and everyone beings to arrive. 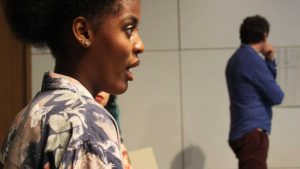 We are gathering in the Gate Theatre as part of a series of workshops focusing on a range of themes including theatre-making, art, space, movement, and music, for adults in direct provision, all of which are set to run over the month of July. The brief has been left open-ended, and the participants are encouraged to explore their own ideas and focus on what most interests them. Coming from a variety of backgrounds and bringing different experiences to the table, there is great a sense of excitement and enthusiasm in the room. After introductions and tea, we work through a series of exercises, sharing our own and each other’s narratives. We start to discuss how we might shape these ideas into a piece of work. We hear stories from Ireland, Nigeria, Syria, the Congo and Egypt. Una, our creative aid, loses no time in catching these ideas, darting rapidly from one end of the room to the other, and scribbling onto sheets of paper stretched out along the walls of the rehearsal room. There is a richness in our collective narratives; everyone has a story and brings an energy to this space, not to mention a total of 18 different languages. As the workshop evolves, we gather in the centre of the rehearsal space and find ourselves forming groups, moving and acting out scenarios before some of the participants begin to sing communally: a South African song, full of hope with beautiful harmonies and completely impromptu. ‘I want to be a Lion’ are the words of Davis, and later adapted into a song which is sung by every member of the group at the end of the workshop. This process is led by the participants with the help of Colm, our resident songwriter. Creative ideas are percolating and beginning to feel cohesive. We look forward with anticipation to the see what will happen over the coming weeks.